Video clip synopsis – Newsreels included events of both political and social importance and were screened all day long in specially designed cinemas. Broadband MP4 cinemanewsreels_bb.mp4 (7.4MB), suitable for iPods and computer downloads. 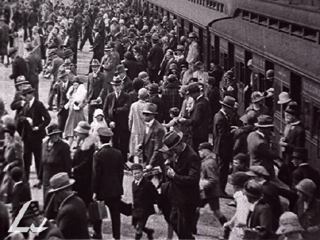 The video clip Royal Melbourne Show is an Australasian Gazette newsreel and is from the National Film and Sound Archive collection, a division of the Australian Film Commission. Royal Melbourne Show is on the From Wireless to Web website, produced in 2005. This interview with Liz Jacka was recorded for the website. Before radio and television, people were kept up-to-date on current affairs by reading a newspaper, or by watching the newsreels that screened as a regular part of the cinema programming. Newsreels were screened along with film previews, cartoons and features. The advent of films with sound made the production of newsreels more expensive, leading to the demise of Australia’s smaller, independent producers. Examples of these pre-sound newsreels have been preserved at the Australian National Film & Sound Archive (NFSA). In what ways were newsreel cinemas different from normal cinemas? Time the running length of the 1926 Royal Melbourne Show video clip, then research and draft a script for it, as though it were a voiceover description to be delivered by a narrator. Make sure the narration suits the on-screen images historically, and that its running time is no longer than the length of the video clip. Practise reading it out loud within the time limit, then deliver your narration to your teacher while the newsreel is screening on the computer screen. An alternative may be to record your narration, with a suitable music soundtrack, which can be used during pauses in the commentary, so that it may be played simultaneously on cassette with the video. In pairs research and prepare a two-page illustrated history of the Movietone and Cinesound newsreel production companies for a popular magazine. Use word-processing or desktop publishing software to create your presentation.